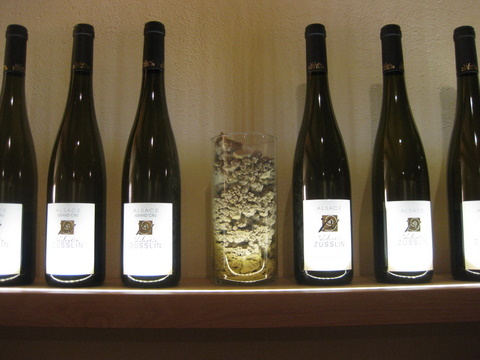 Alsace Wines: Dry, Sweet or Somewhere in-between? The vexed question of sweetness in Alsace wines refuses to lie down – it’s been the subject of vigorous and enlightening discussion in recent French Wine Society forums in connection with the Alsace Masters-Level Program currently running, headed by Thierry Meyer. Here’s the nuts-and-bolts of a piece I wrote for Decanter in 2009. Sadly, the picture hasn’t changed much since then: there’s still no consensus on how best to inform the consumer, and confusion continues to reign. “Alsace is on the dry side of the Rhine” or so Pierre-Etienne Dopff of Dopff au Moulin was fond of saying in the early 90s when I was researching my book A Taste of Alsace. He wasn’t alone in holding this view. The wines’ traditional image – rich, aromatic, fruity but reliably dry – was well established, nurtured alike by winemakers and by CIVA (Conseil Interprofessionel des Vins d’Alsace, the region’s wine promotion body), and well understood and appreciated by the consumer. But of late things appear to have slipped a bit and the claim that many wines are getting too sweet for their own good is fast becoming a clamour. Jancis Robinson in the Financial Times, Eric Asimov in the New York Times and Tom Stevenson in his Wine Report have all complained on occasion that it’s getting harder to decode Alsace wine, and impossible to tell before popping the cork how dry (or not) this particular drop will be. Is all this talk of an Alsace sugar rush just something got up by the Chattering Glasses? Or is there a real problem? Where exactly does the problem lie? Not with Vendanges Tardives or Sélection de Grains Nobles wines, which are by definition sweet-natured. Nor with the great, old-established houses (Hugel, Trimbach, Beyer) who have made their name with dry wines. Neither is there an issue with those eminent winegrowers (Zind-Humbrecht, Domaine Weinbach, Schlumberger, Rolly Gassmann) who have carved out a niche for themselves with consistent, well understood and widely admired wine styles that are often characterised by some residual sugar. The problem lies mainly with entry-level AOC wines, but also with some Grand Crus and lieux-dits (named vineyard sites), any of which can be startlingly sweet. Such wines are failing to connect with their most obvious market – the undecided buyer who’s looking for clear, bright, fresh varietal character, wines that are pleasurable but not simplistic, “plaisant, mais pas complaisant” (to quote consultant oenologist Denis Dubourdieu, who has advised the Ribeauvillé Cave). Most punters, when faced with the hurly burly of Alsace wines and their unpredictable sweetness levels settle rather for the deep peace of a generic Sauvignon or Chardonnay. How has Alsace, for years known as a producer of aromatic, fruity, reliably dry white wines, ended up in the dock for producing too many sweet ones? A number of possible explanations are wheeled out, ranging from global warming (average summer temperatures in this already sun-privileged region have certainly increased in the last two decades) to reduced yields (down from an absurdly high 120 hectolitres per hectare to 80-96 hl/ha for straight AOC wines, and 55-66hl/ha for Grands Crus). There’s even a suggestion that the region’s passionate dash to biodynamics could be a contributory factor. Any of these propositions are apt to raise eyebrows. After all, global warming, reduced yields and biodynamics are not exclusive to Alsace, but common to other vineyards at similar latitudes, where raised sugar levels are not, seemingly, an issue. So what’s to be done? For a start, better information is needed about likely sweetness levels, acknowledges Jean-Louis Vézien. Over the years there have been countless proposals, including 1) a single designation to cover dry wines (with the implication that all other wines were sweet(er)); 2) a sweet-only designation for wines exceeding a prescribed residual sugar level (thereby emphasizing precisely the trait – sweetness – that most would like to see in retreat); 3) a pictogram indicating sweetness on a scale from 1-10 (Zind-Humbrecht uses a scale of 1-5, and there are countless others, all different); and 4) an upper limit on residual sugar in Riesling. A system proposed by CIVA in January 2009 to its 7000-odd members was to adopt European regulations on sugar levels. According to this system, AOC and Grand Cru wines would fall into one of four categories: sec, demi-sec, moelleux or doux (dry, medium-dry, medium-sweet, sweet) with each category subject to strictly defined sugar and acidity levels. The system has been adopted with some success by Ribeauvillé’s Cave Cooperative. The problem was, the four-tier categorisation was only ever optional (to make it compulsory would have required a decree by the French government, a complicated and lengthy business). CIVA could thus only urge but not oblige its members to adopt it, so there was little chance of it ever being adopted. Latest news is that CIVA has abandoned this idea in favour of a scale of 1 to 10 (1 being the driest and 10 the sweetest). Debate will doubtless continue to rage and there seems little risk of an imminent solution. Meanwhile, take a tip from Thierry Meyer who advises that “the best way to figure out what you have in a bottle is to know Alsace wine better!” Set up some tastings using a range of bottles sourced wherever you are. Better still, travel to the region (on your own or with the help of one of my vineyard tours). Then work your way through the different cépages, get to know the diverse terroirs, the geology of the various vineyards, the particular house style, the vintage and all the other factors that together will influence the perception of sweetness in the wines. Then you can decide for yourself which wines suit your palate, your pocket and – most importantly – your menu. It will be a voyage rich in vinous discoveries. At the end of it you will be entitled to speak with authority on which wines in Alsace are dry, which sweet, and which somewhere in between. Sue that was a really a very interesting article, as I to have been perplexed by the changes in Alsatian wines. I’m looking forward to seeing you and getting more knowledge on these wonderful vineyards.